So, same time next Thursday? Here's where you’ll find our sale prices on mobiles, plans, home internet, and more. Includes deals that are only available online and only for a limited time. Lease the Samsung Galaxy S10e 128GB in White or Black before 29.04.19 and get $10 monthly credit for 24 months. While stocks last. Lease plans only. Buy the iPhone 8 Plus 256GB in Space Grey on a Mobile Plan and get $20 monthly credit for 24 months. While stocks last. Purchase plans only. Here’s a tasty Easter treat. $10/mth off your new phone. Take up a new phone on a plan and enjoy an extra $10 credit each month of your 24-month plan. Offer ends 29/04/2019, so hop to it. Buy the Apple iPad (5th Gen) 32GB Space Grey 4GX and save $10/mth over 24 months on our medium and large mobile broadband plans. $10 credit for calls & texts. Grab a $30 SIM Kit for $20, with 27GB of data and 28 days expiry. Online only, limit 2 per customer. Purchase and activate by 13 May 2019. Get reliable home internet with no lock-in service contract. Save $99 on all plans and packages when you sign up online. Min cost $1,896 over 24 months. 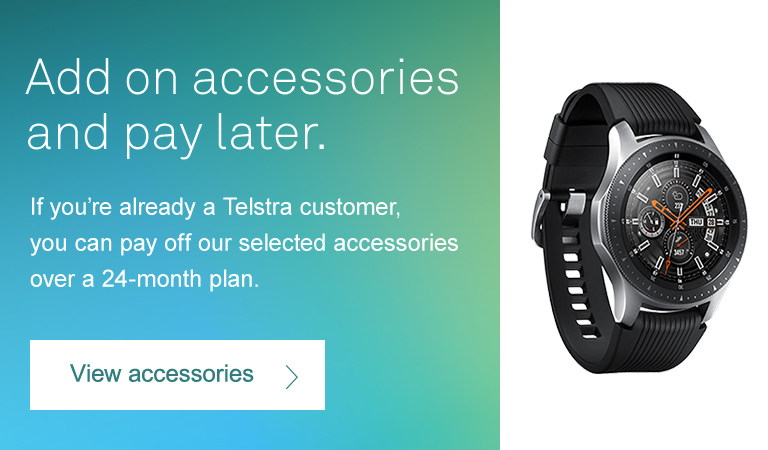 Choose our unlimited internet + Telstra TV package and watch up to 20 new release rentals on us. All for just $99/mth. Min cost $2,376 over 24 months. Buy the new Samsung Galaxy S10+ today and get an exclusive upgrade to the 5G handset when it arrives – at no extra cost. Limited time handset trade-in offer. S10+ to be returned in good working order. Was $559, now $499! Series 3 Apple Watch with GPS + Cellular. Features a 38mm Silver Aluminum Case with Seashell Sport Loop. Only available online in the Silver 38mm models. While stocks last. Watch over 50 sports live and on demand with Kayo. Sign up today and get your first two months of Kayo Basic for just $5. Monthly subscription, $25/mth after offer period. Only available online in black and white colourways. While stocks last. Contract term is 24 months. Min cost is $1176. Data for use in Australia only. Buy the Apple iPad (5th Gen) 32GB Space Grey 4GX and save $10/mth on our 24-month medium and large mobile broadband plans. Lease the Samsung Galaxy S10e (black or white) and save $10/mth over 24 months. Buy the iPhone 8 Plus 256 Space Grey and save $10/mth over 24 months. Buy the Apple iPad 32GB Space Grey 4GX and save up to $10/mth on our 24-month medium and large mobile broadband plans. Subscription charges for streaming services may apply.